Epic Pony 1E | Retired Ponies Figurines | One Price Low Flat Shipping! From the Trail of Painted Ponies First Edition, Epic. Designed by artist, Jeffrey Chan. Made of hand-painted resin. Measures 6" tall. Stone tablets have played an important role in the heritage of Chinese culture. 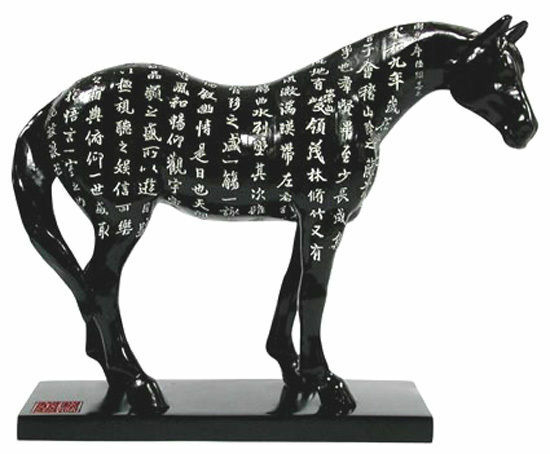 Knowing this, Jeffrey Chan, an art designer for Hong Kong movies who also specializes in giftware design, conceived of a glossy black Pony on which a famous poem was carved in a manner that captured the beauty of the art of Chinese calligraphy. The poem, Orchid Pavilion Preface, was written in 352 A.D. by Wang Xizhi, one of the most highly respected calligraphers and poets in Chinese history. It is a masterpiece that speaks to the happiness and grace of every living moment. This is a first edition model. These highly collectible versions are from the first production run manufactured, which is indicated on the bottom of the pony base with the "1E" prefix before the hand-written serial number. Ideal for the elite collector.